This article is about the pasta dish. For the secret society, see Carbonari. Not to be confused with carbonera. For other uses, see Carbonara (disambiguation). Carbonara (Italian: [karboˈnaːra]) is an Italian pasta dish from Rome made with eggs, cheese (Pecorino Romano or Parmigiano-Reggiano), bacon (guanciale or pancetta), and black pepper. Spaghetti is the usual pasta; however, fettuccine, rigatoni, linguine or bucatini can also be used. The dish was created in the middle of the 20th century. The pork is cooked in fat, which may be olive oil, lard, or less frequently butter. The hot pasta is combined with a mixture of raw eggs, cheese, and a fat (butter, olive oil, or rarely cream) away from additional direct heat to avoid coagulating the egg, either in the pasta pot or in a serving dish. The eggs should create a creamy sauce, and not curdle. Guanciale is the most commonly used meat in Italy, but pancetta and local bacon are also used. Recipes differ in the use of egg: some use the whole egg, others only the yolk, some a mixture. Cream is not common in Italian recipes, but is often used elsewhere. Garlic is similarly found mostly outside Italy. Other variations on carbonara outside Italy may include peas, broccoli, mushrooms, or other vegetables. Many of these preparations have more sauce than the Italian versions. The dish forms part of a family of dishes involving pasta with bacon, cheese, and pepper, such as spaghetti alla gricia. Indeed, it is very similar to the southern Italian pasta cacio e uova, dressed with melted lard and mixed eggs and cheese. There are many theories for the origin of the name, which may be more recent than the dish itself. Since the name is derived from carbonaro (the Italian word for charcoal burner), some believe the dish was first made as a hearty meal for Italian charcoal workers. In parts of the United States the etymology gave rise to the term "coal miner's spaghetti". It has even been suggested that it was created as a tribute to the Carbonari ("charcoalmen"), a secret society prominent in the early, repressed stages of Italian unification. It seems more likely that it is an urban dish from Rome, although it has nothing to do with the Roman restaurant of the same name. Pasta alla Carbonara was included in Elizabeth David's Italian Food, an English-language cookbook published in Great Britain in 1954. However, the dish is not present in Ada Boni's 1930 classic La Cucina Romana and is unrecorded before the Second World War. In 1950 it was described in the Italian newspaper "La Stampa" as a dish sought by the American officers after the allied liberation of Rome in 1944. It was first described after the war as a Roman dish, when many Italians were eating eggs and bacon supplied by troops from the United States. 1 2 3 4 Gosetti della Salda, Anna (1967). Le Ricette Regionali Italiane (in Italian). Milan: Solares. p. 696. ISBN 978-88-900219-0-9. 1 2 Carnacina, Luigi; Buonassisi, Vincenzo (1975). Roma in Cucina (in Italian). Milan: Giunti Martello. p. 91. OCLC 14086124. 1 2 Alberini, Massimo; Mistretta, Giorgio (1984). Guida all'Italia gastronomica (in Italian). Touring Club Italiano. p. 286. OCLC 14164964. 1 2 3 4 5 Buccini, Anthony F. (October 2007). "On Spaghetti alla Carbonara and Related Dishes of Central and Southern Italy". In Hosking, Richard. Eggs in Cookery: Proceedings of the Oxford Symposium on Food and Cookery 2006. Prospect Books. pp. 36–47. ISBN 1-903018-54-4. ↑ Ricettario Nazionale delle Cucine Regionali Italiane. Accademia Italiana della Cucina. ↑ Carnacina, Luigi; Veronelli, Luigi (1977). "Vol. 2, Italia Centrale". La cucina Rustica Regionale. Rizzoli. OCLC 797623404. republication of La Buona Vera Cucina Italiana, 1966. ↑ Buonassisi, Vincenzo (1985). Il Nuovo Codice della Pasta. Rizzoli. 1 2 Herbst, Sharon Tyler; Herbst, Ron (2007). "alla Carbonara". The New Food Lover's Companion, Fourth Edition. Barron's Educational Series. ISBN 0-7641-3577-5. ↑ "Fettucine Carbonara". Better Homes and Gardens. Yahoo!7 Food. 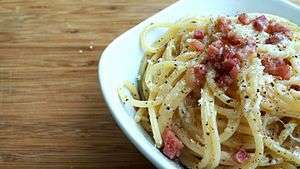 ↑ "Spaghetti Carbonara Recipe". italianpastarecipes.it. ↑ Carluccio, Antonio (2002). "Spaghetti alla Carbonara". Antonio Carluccio's Southern Italian Feast. BBC Worldwide ISBN 0563551879. ↑ "Spaghetti alla Carbonara (all'uso di Roma)". ↑ Marchesi, Gualtiero (2015). La cucina italiana. Il grande ricettario. De Agostini ISBN 8851127336. 1 2 Labensky, Sarah R; Alan M. House (2003). On Cooking, Third Edition: Techniques from expert chefs. Pearson Education, Inc. ISBN 0-13-045241-6. ↑ Oliver, Jamie (2016). "Gennaro's classic spaghetti carbonara". ↑ Perry, Neil; Carter, Earl; Fairlie-Cuninghame, Sue (2006). The Food I Love: Beautiful, Simple Food to Cook at Home. Simon and Schuster. p. 114. ISBN 978-0-7432-9245-0. ↑ Mariani, Galina; Tedeschi, Laura (2000). The Italian-American cookbook: a feast of food from a great American cooking tradition. Harvard Common. pp. 140–41. ISBN 978-1-55832-166-3. ↑ Russo, Andrea. "La Carbonara, una storia di famiglia" (in Italian). La Carbonara. Archived from the original on 2015-09-26. ↑ David, Elizabeth (1954). Italian Food. Great Britain: Macdonald. ↑ "La Stampa - Consultazione Archivio". archiviolastampa.it. ↑ Davidson, Alan (1999). Oxford Companion to Food. Oxford: Oxford UP. p. 740. ISBN 0-19-211579-0. Wikimedia Commons has media related to Spaghetti alla Carbonara.